I was never much of a fan of westerns, in any form. I did get my share of movies, but I don’t recall to have read any fiction of the genre. Nothing has changed in the meantime, but there were two novels that address the matter in a way that picked my interest a little. The reasons, well, foremost the cover artwork of both novels, one signed by one of my top favorite artists, Raymond Swanland, and the other by Dominick Saponaro. Secondly, the elements of speculative fiction that give the western theme a more appealing touch. A mix of steampunk, fantasy and western still is not exactly my cup of tea, but keeping to one’s comfort zone doesn’t always bring the joy of new discoveries. Then why not the steampunk-western-fantasy of R.S. Belcher’s “The Six Gun Tarot” and Guy Adams’ “The Good, the Bad and the Infernal”? R.S. 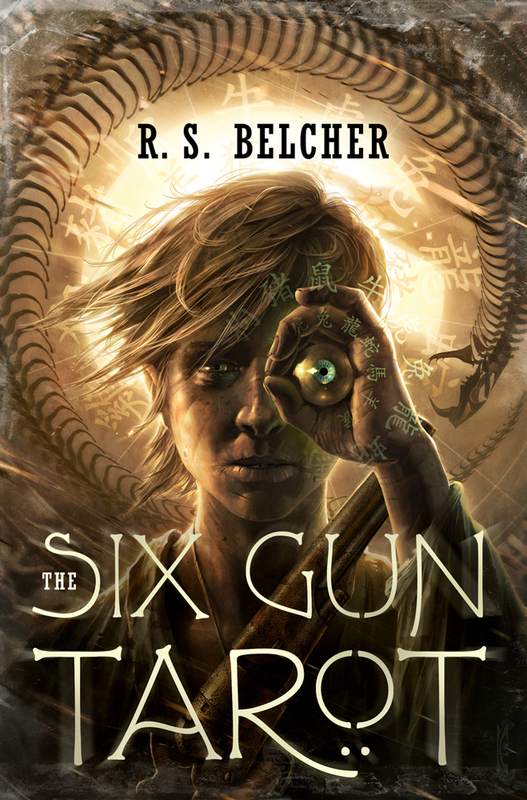 Belcher’s “The Six Gun Tarot” is due to be released by Tor Books on 22nd of January and it came into my attention because of the cover signed Raymond Swanland. It is true that it is the debut novel of R.S. Blecher, but I discovered debuts in the past long before seeing their covers. The artwork sees a little departure from Raymond Swanland’s usual book covers, but it is closer to the style of his “Priest” comic book covers. Nonetheless, an awesome cover. A haven for the blessed and the damned, Golgotha has known many strange events, but nothing like the primordial darkness stirring in the abandoned silver mine overlooking the town. Bleeding midnight, an ancient evil is spilling into the world, and unless the sheriff and his posse can saddle up in time, Golgotha will have seen its last dawn…and so will all of Creation. In the case of Guy Adams’ “The Good, the Bad and the Infernal”, I was less familiar with the artist of the cover artwork than with the writer. Guy Adams is an established author already and the news of a new novel, due to be released by Solaris Books in March in the US and in April in the UK, reached me before I took a glimpse on the cover artwork. I said on plenty of occasions that I am not much of an admirer of characters on book covers, but there are some of them that certainly look good. And this one is one of them. Nothing striking about the drawn characters to influence the reading experience, but enough to make a reader curious. It also led me to the discovery of Dominick Saponaro and his interesting portfolio. A weird western, a gun-toting, cigarrillo-chewing fantasy built from hangman’s rope and spent bullets. The west has never been wilder. 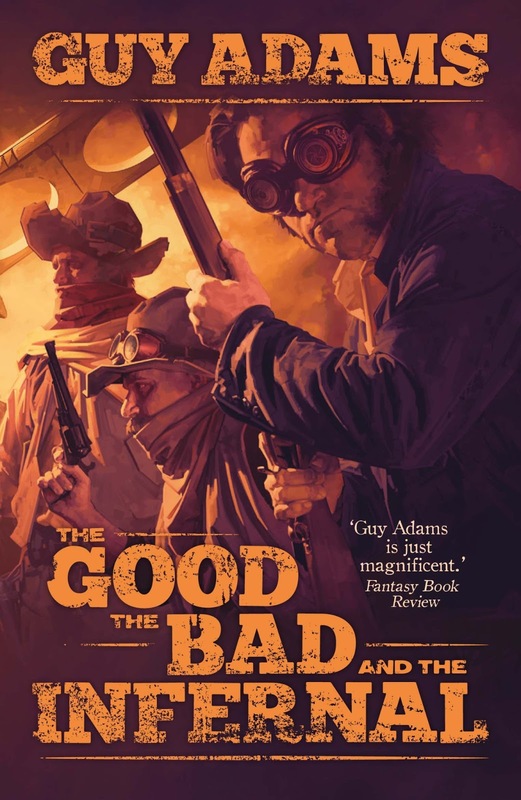 A Steampunk-Western-Fantasy from Guy Adams. Every one hundred years a town appears. From a small village in the peaks of Tibet to a gathering of mud huts in the jungles of South American, it can take many forms. It exists for twenty-four hours then vanishes once more, but for that single day it contains the greatest miracle a man could imagine: a doorway to Heaven. It is due to appear on the 21st September 1889 as a ghost town in the American Midwest. When it does there are many who hope to be there: traveling preacher Obeisance Hicks and his simple messiah, a brain-damaged Civil War veteran; Henry and Harmonium Jones and their freak show pack of outlaws; the Brothers of Ruth and their sponsor Lord Forset (inventor of the Forset Thunderpack and other incendiary modes of personal transport); finally, an aging gunslinger who lost his wings at the very beginning of creation and wants nothing more than to settle old scores.